I've been adding the white background to the hexagons for my Road 66 Quilt from Di Ford's book, Primarily Quilts. I wanted to see how the fussy cut diamonds would look when the blocks were joined, so I've cut a few of those and joined the first two blocks. I started working on cutting the hexagons for this quilt before I started work on the Rotherfields Grey center and got a bit sidetracked adding rounds to it. Most of the hexagons I've made so far have at least one fussy cut round and a fussy cut center. I've had so much fun cutting the pieces for these blocks, that I probably have enough cut to make 2 quilts or to make this one really huge. I've finished the next two borders on my Rotherfield Greys quilt. I feel the same with this quilt as I did with my Dear Jane quilt. I'll be excited to see the quilt top finished, but at the same time I'll be a bit sad to see it end. I have really enjoyed all of the different borders on this quilt. I really like how the mitered border print frames all of the elongated churn dash blocks. Sometimes my photos make my quilts look like they're not quite square. I checked this corner (below) after looking at the photo, and it wasn't square. So I took the mitered border off and squared the corner and put the miter back on. The last planned border is 1" six pointed stars and I've started working on those. The quilt finishes at 84" X 84". There are 52 of these little 1" stars that are English Paper Pieced and then appliqued onto a background. Each star has the same tan points, and I've fussy cut all of those. You can find my fussy cutting tutorial here. There is also a link to it under my blog header. I'm linking up with Judy for Design Wall Monday at Pachwork times. Hello everyone. Hope you are enjoying a nice Friday. I probably spend as much time trying to think up a title for my blog posts as I do taking photos. It's hard to come up with something original because I keep making these six pointed stars. They are really addictive. Here are my stars so far. They are 2" six pointed stars and are English Paper Pieced. I ordered my papers from Paper Pieces.com. They have now moved to Paducah, KY, and I can't wait to visit their store when I go to the AQS Quilt show there next year. I'm sewing along with Fussy Cut Fridays at Temecula Quilt Company blog. It is week #25. I have 35 stars so far so I'm a little ahead of the game. The fabric I used for the first star is Alexandria by Jo Morton for Andover fabrics. This pink fabric is an oldie from my stash. It is Williamsburg Randolph by Windham fabrics. Here is the link to my Fussy Cutting Tutorial if you are thinking about making some of these fussy cut six pointed stars. The other night I couldn't sleep, so I decided that I would cut the red and white strips for the next border on a UFO Christmas quilt that I've been working on. I'm working without a net because I don't have my book (more on that in a later post). I looked at a photo of the quilt on line. The blocks are 6 inches finished so I needed 2 units per block. That means each one would be 3 1/2" cut before sewing to finish at 3". So I cut my 3 1/2" strips and then cut the half square triangles using my Easy Angle ruler. That way I would be all ready to sew the next morning. And I did. I sewed off and on all the next day. I not only sewed the 80 half square triangles that I needed, but I'd cut 20 extra so I sewed a total of 100 half square triangles thinking maybe I could use the extras in the backing. Then I looked at the quilt photo again and noticed that the border isn't half square triangles, but it is 3 1/2" flying geese units. Well at least I got the 3 1/2" measurement right even if I did sew 100 of the wrong thing. So I'm going to do a Flying Geese Tutorial using the connector corner method. (I think if you click on the photos, you can see what I typed next to each unit. In case you can't read the typing there, the first photo shows a pencil line drawn diagonally on the back side of the square. That insures accuracy and makes a perfect unit if you sew on the line. The second photo shows a square with a diagonal crease pressed in it. It is a little harder to stay on the line, but it is a little faster than drawing the line on each square. Then there is the third method (which is what I usually use). Do you remember the late Mary Ellen Hopkins? Whenever she would be on Simply Quilts on HGTV, I would tape her so that I could watch it over and over. She's probably best known for the book, It's OK If You Sit On My Quilt. She also taught me about using connector corners to make flying geese. She said to start sewing and aim for the opposite corner and swing wide toward the outside. So that's what I do. After doing 80 of these, accuracy improves quite a bit! After I sew the first corner on all my units, I cut out the part of the white square toward the outside corner (photo below). Then I press toward the corner (photo below). Then I sew the second square on, trim out the corner of the white square and press. The reason I trim is to reduce the bulk whenever quilting. It's also fine to leave it in the quilt. If you are a hand quilter, you will want to cut out the excess. Also, if you are making a quilt with a lot of seams, it is best to cut out that extra fabric to reduce the overall weight of the quilt. I don't cut the red rectangle, because I know that it is cut 3 1/2" X 2" so in theory it is accurate. I usually turn the unit to the back and trim the white that overhangs either with scissors or a rotary cutter. This gives you a 1/4" seam allowance at the top so that when the unit is sewn into your quilt, you won't lose the red point. To make a 3 inch FINISHED flying geese unit, I cut the red rectangle 3 1/2" X 2". The white squares are cut at 2". So it's back to the sewing machine to finish the right unit. I'll put the 100 half square triangles away until I come up with an idea to use them. This wasn't the post that I planned for today. Sorry to be so wordy!!!! I've finished more six pointed stars that I'll post next time. I hope you are all enjoying this beautiful weekend. This is my latest six pointed star from the Temecula Quilt Company blog sew along. My camera decided to stop working a few days ago. It was the camera that I'd used since I started blogging. So I've done a bit of research and bought a Nikon Coolpix 3500. I wanted something that I could mostly point and shoot and would fit easily into my purse. I've been practicing with it the last couple of days, and I think I've finally decided that I should probably put the disk in my laptop and read the instruction manual. 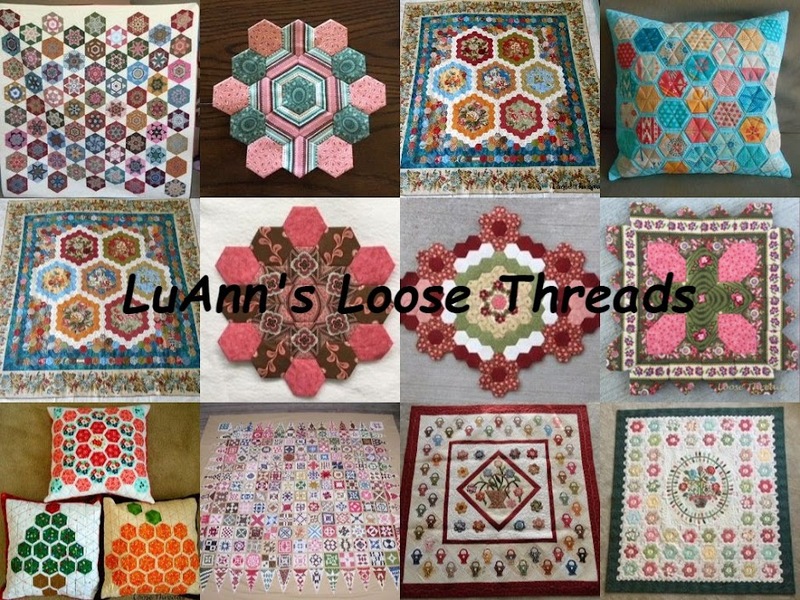 Here is another Lucy Boston Patchwork of the Crosses block. I'm making one block a month along with a couple of friends. And....three more six pointed stars. This is the fabric I used in the bottom star in the photo above and the first star in this post. I really love Jason Yenter's fabric lines. The top right star is from a piece by Judie Rothermel. The top left star is from Jo Morton's Amelia Collection. A couple photos of my day lilies with the new camera. Thanks to each and every one of you who stops by my blog to read what I'm up to. The end is in sight for my Rotherfield Greys quilt from the book Primarily Quilts by Di Ford. These are my two favorite blocks from this border. Each block looks like a little doll quilt, and they measure 4 1/2" X 6 1/2". I am really enjoying this round. Here are all of the blocks finished (44 total). I have this border left with these modified churn dash blocks, then a round of a border print, and then lots of 1" six pointed diamonds (52 of them) that are appliqued onto squares. Then I had to stop and do the hand work on the corners before attaching the last two sides. The corners are fussy cut 1" six pointed diamonds that are English Paper Pieced with four applique flowers on each block. I spent some time yesterday afternoon out on the deck working on the flowers.